Another week starts... and I hope & pray this one won't be a total fiasco like last week was. Oh well, the way last week was, anything will be better than that! :) Did manage to break an old ms out (making me go *gasp! I wrote such crap??? *) and break out the Pilates mat once again - first time this year - which made some muscles in the backs of my arms, in my back, and my hamstrings, to complain along the lines of "We were doing perfectly fine not acknowledging our existence, so why did you have to go and make us work???" 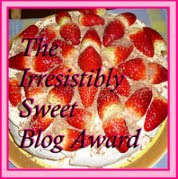 Last Tuesday, fellow SSS author Paula Martin bestowed me with a lovely "Irresistibly Sweet Blog Award". In line with that honour, I have to disclose 7 things about me you might not know. 1. When I was a kid, I wanted to be an accountant. Lol, no - not temporary madness; more like hero worship. I have an elder brother - he was 16 when I was born. So by the time I was a little kid, he was already a grown man on the town, and working towards earning his ACCA degree. I adored my big brother, and wanted to be like him, hence the desire to be an accountant like him. 2. I get my small stature from my mother. She's even smaller than I am, barely 5"1 tall. After 2 kids, she's 'rounded' up a bit, but back in her day, she was trim as a willow. She got married at 21, and to this day, I haven't managed to try on her wedding dress - the waist doesn't even pass over my shoulders! 4. I've always been story-inclined. Back in primary school, we had to write 120-words essays and picture compositions in English & French, and I always went over the word count. My teacher would often drop by my desk and go, "You writing up a novel again, girl?" 5. I hated soft drinks when I was younger. Then all went to hell in a handbasket when I got pregnant and craved Pepsi like I wouldn't live if I didn't have an ice-cold glass stat! thanks for the award Zee. That was so sweet :D Sadly I don’t have time to do a blog. It's sad how hectic life has gotten today, innit? Oh my, Zee, I thank you for the lovely award and will post it up asap. I loved learning those things about you. Bullying, though, is not fun. I never had that, exclusion was the name of the game when i was at school. Not quite the full'sending to Coventry bit' but close. But like you say what doesn't kill you makes you stronger. I'm glad you see them as you do now.